Close your eyes and dream of your perfect Italian hill town. Tidy brick buildings with pretty piazzas and romantic lanes, lounging on its hill amidst a dreamy countryside striped with vines and bathed in that inimitable ethereal light. Picture it? This timeless town unfurls along a ridge in the southern section of Le Marche region. It’s a gentile Old World oasis surrounded by vineyards and olive groves. It is the postcard image most people envision of Italian countryside, complete with stone farmhouses scattered in the rippled hills, sunflower fields, and unspoiled villages on the hilltops. Ripatransone, or just Ripa as most people in the area call it, measures up to any Tuscan town in ambiance, with its mix of medieval and Renaissance styles. But Ripatransone has an added benefit—it’s less than 10 miles from the palm-fringed Adriatic Sea. I loved it from my first visit; after wandering past palaces and stylish streets, I stumbled into the Pasticceria Centrale and sunk my teeth into their killer cream puffs. Buttery, flaky, and not-too-sweet cream filling, it was like eating a cloud. At the end of the day, the wine bar down the street clinched it for me. It’s set beneath the portico-faced Palazzo del Podestà with a courtyard garden hidden behind it. I sipped wine there with the vineyards in view. I returned many times to Ripatransone after that, and felt the same adoration each time. This is the heart of Le Marche’s wine country, where hearty ruby reds win awards and where surprisingly full-bodied whites can even stand up with the area’s pork dishes and addictive meat-stuffed fried olives. There are wineries along every country road. The area’s cooperative is a few miles outside town; it racks up accolades, but still sells vino sfuso from the vats (bring your own jug to fill for $1.50 a liter). In Ripatransone and Le Marche in general, there is a cultured beauty even while carrying on a rural and unpretentious lifestyle. Sunset wine trekking is a thing here. Around town there are art-adorned churches and museums, an archeology museum, and a jewelry-box-style theater, along with an open-air amphitheater set in the remains of the ancient fortifications where summer concerts brighten the evenings. They host delectable food festivals all year long, an Oktoberfest party, and a rollicking raucous fireworks-laden “horse of fire” festival to honor their patron saint in blow-out style. A little dangerous, perhaps, with all the sparks flying airborne, but it is an undying tradition here in Ripa since 1682. 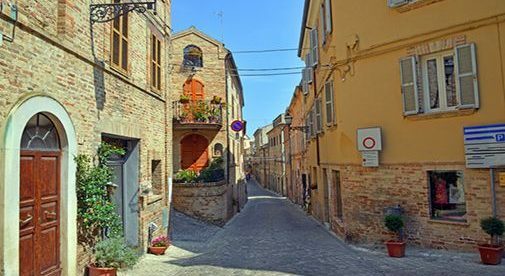 If things start to feel a little boring around town, the beach is only 15 minutes away; San Benedetto del Tronto is dubbed “the Rimini of Le Marche” with its summer party scene, but it also boasts some high-end shopping and excellent seafood restaurants along with miles of sandy beaches. The travertine splendor of Ascoli Piceno, the provincial capital, is just a little more than a half-hour away with elegant piazzas and upscale entertainment. The airport at Ancona is in reach in an hour to jet off to other parts of Europe. A two-story townhouse with barrel brick ceilings and a garden, just two minutes from the piazza, is on sale for €90,000 ($102,393). In this area, many of the dreamy farmhouses cost upwards from €350,000, but I spotted an attractive country home on more than seven acres of land with fruit trees and an olive grove for €140,000 ($159,278). It has three bedrooms, two baths, a cellar and attic and is surrounded by vineyards and the patchwork rolling hills. This unspoiled, picturesque town is the kind of place that can bring your Italian dreams into reach of reality.